Time to tuck your garden into bed for winter! — Put in bulbs. 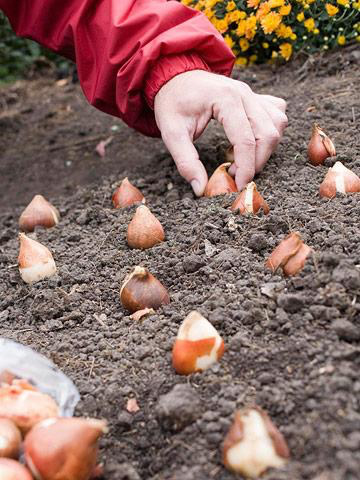 Envision your yard filled with colorful crocuses, hyacinths, daffodils and tulips in a few months, and you’ll be glad to know you can still plant spring-blooming bulbs until the ground starts to freeze. Just be sure to purchase firm, large, healthy-looking bulbs, even if they’re on clearance! — Add mums to your deck, patio or garden. Florist’s mums aren’t winter-hardy but are tidy-looking with large flowers; they’re perfect for pots. Garden mums are more wild-looking and will come back again next year; plant them in the ground as perennials. — Wrap trees. 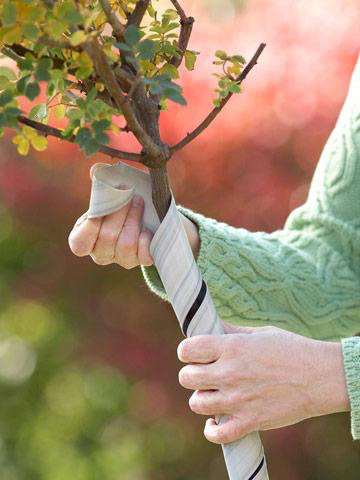 Young trees, those just a year or two old, and fruit trees will appreciate a protective wrap around their trunks. 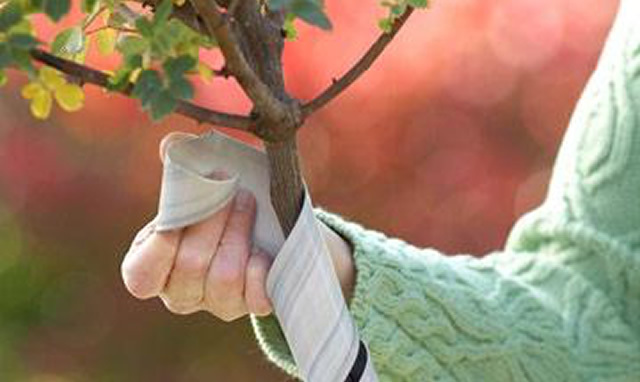 The rolls of paper, plastic or foam-based wrap will protect trees from winter scald and rabbit damage. Remove in the spring. — Wrap roses in cold regions. In Zones 5 and colder, wrap tender types of roses in burlap. With hybrid teas, the least cold-hardy of all, instead of burlap use chicken wire or another material to make a collar at least 2 feet high around the rose and fill in with straw or chopped autumn leaves. — Mulch roses. Heap 6 inches to 1 foot of loose soil or compost over the base of your rosebushes to protect them from winter extremes. — Mulch strawberries with straw. Do this before the temperature drops to 20°F, then put large branches or other weights on top to keep the straw from blowing. — Keep raking! 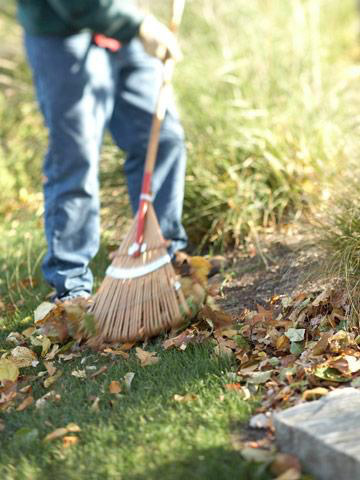 Don’t worry about leaves that collect around shrubs and perennial plantings — they’ll provide protection until spring. But don’t allow leaves to hang out for more than a few days on lawns because they suffocate the grass. — Water as needed. If the fall has been unseasonably dry, water newly planted trees, shrubs and other new plantings. — Clean out beds. After the first killing frost, tear out annuals and cut back perennials, except those you’d like to keep standing for winter interest, such as sedum and grasses. 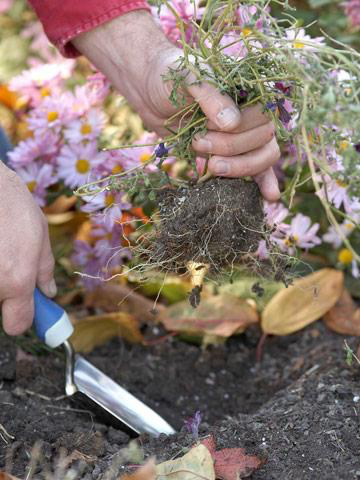 You can also cut back perennials in the early spring, but you might as well get started on the task now. — Store tender bulbs. After the first frost, dig up tender bulbs, such as gladiolus, cannas, dahlias and caladiums, that won’t survive the winter. Store indoors in a cardboard box or paper bag filled with sawdust or other dry, loose material. This will let them “breathe” so they’ll be ready for replanting next spring. For details, click “Storing Tender Flower Garden Bulbs” in the Related Links box below. — Care for metal tools. 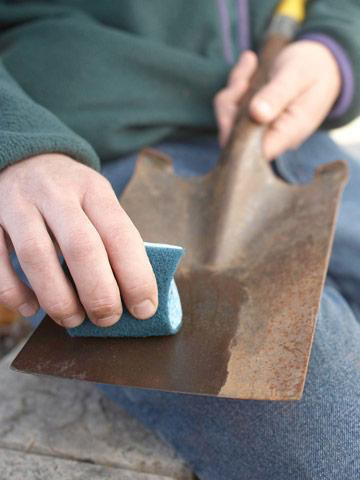 After scrubbing and drying metal tools, rub them with a bit of motor, vegetable or linseed oil to prevent rust. Use a tool file to sharpen dull tools, or take them in for sharpening. — Service your mower. If you’ve made your final mowing of the season, run the mower until all gasoline is gone. Clean the top and underside of the mower for winter storage. Follow manufacturer directions on oil and oil filters. Have the blade sharpened. — Remove hoses. Unscrew them from outdoor faucets, or freezing may damage the faucet. Drain hoses and store for the winter.